I woke up really early this morning. I just couldn’t sleep. Really, I couldn’t wait to get out into the garden. Does anyone else do that? Get up at six to start gardening? After last night’s winds and rain everything needed a little cleaning. The peas had crumbled under their own weight, so I harvested what was left and cut the rest down. Next year, we’ll grow them against our chain-link fence for more support. I pulled a bunch of radishes that failed to form. I’ll have to read up on growing radishes, but at least today I got a lot of greens to cook up for breakfast. The strawberry patch is going steady too, so I picked our biggest harvest of strawberries yet. Then I got to work on breakfast. When we first moved into this house we had no kitchen. We had also just joined a CSA for the first time. The timing was less than convenient, but at least we had the grill out back. One of our staple meals during that period was greens and eggs, made in an aluminum pan on the grill. Sliced thinly, Swiss chard made the perfect nest for gently poached eggs, making for a quick and filling meal. 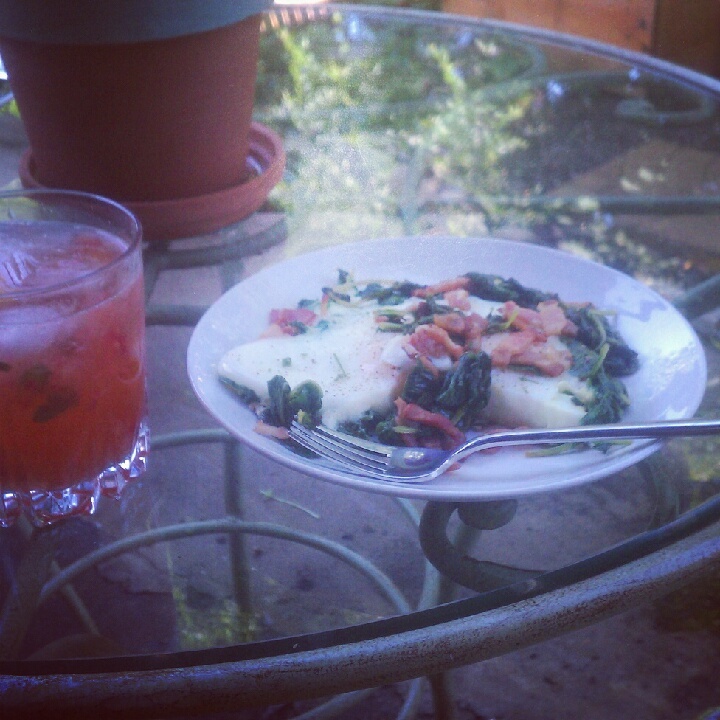 Today, I used the radish greens and an onion from the garden, plus a slice of bacon. This is typically how I use bacon, a slice here or there for the flavor. I also wanted to make something special with our huge (about a cup, ha ha) strawberry harvest. I paired it with some African Blue Basil that we’re growing and a couple of limes we had in the fridge for a delicious muddled drink. I love when meals come together like this! In a large skillet, cook the bacon, onion, and garlic until everything is just starting to brown. Add the greens and saute just until they start to wilt. Using a spoon, make a large indentation in the middle of the greens, this is where your eggs will go. Reduce heat to low and cover. Let simmer until the eggs are cooked to your liking, anywhere from 5 to 10 minutes. Garnish with some chopped chives and black pepper. Using a mortar and pestle, muddle the basil, strawberries and sugar until well combined. Pour this mixture into a pitcher and add the lime juice and cold water. Stir to combine. Pour over ice and garnish with fresh basil leaves.